The KAIST team tweaks HUBO's bipedal reactions in their Daejeon-based research lab, late last week. 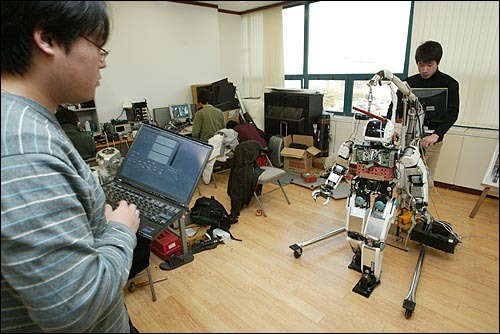 The world's leanest and meanest humanoid robot "HUBO," an ongoing project at the Korea Advanced Institute of Science & Technology (KAIST), has been getting a lot of attention in the robotics community worldwide since it was announced earlier this month. At a relatively inexpensive 1 billion won (US$1 million), HUBO follows in the footsteps of Honda's robot dubbed "ASIMO," but using the latest materials and innovative designs, the KAIST team has made waves with its rapid progress -- three generations in as many years. By contrast, ASIMO took 15 years and cost 300 billion won (US$300 million). HUBO, which is derived from the words "humanoid" and "robot," was completed late last year by KAIST mechanical engineering professor Oh Jun Ho and his five-person Ph.D student team. 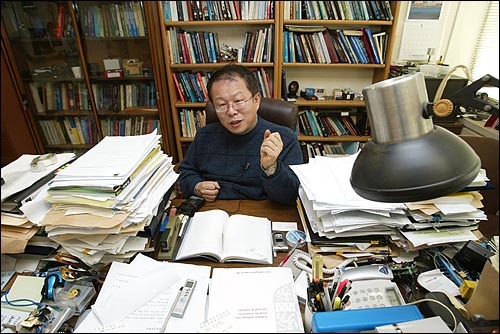 HUBO team leader and KAIST professor of mechanical engineering Oh Jun Ho speaks with OhmyNews in his office in Daejeon, just south of Seoul. Work on the first generation, dubbed KHR-1, began in January 2002 and within a year the team had the prototype walking efficiently. KHR-2 went through heavy testing to improve the integration of the hardware and software and increase its stability. 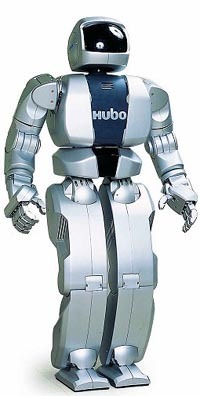 HUBO stands 120cm tall and weighs 55kg. It has 41 joints, enabling it to maneuver and walk at 1.25 km/h. It also has individually controlled fingers, a first in humanoid robotics. It's vision capabilities can recognize objects and the robot can respond to visual and auditory input using a voice recognition system. OhmyNews reporter Lee Sung Kyu spoke with HUBO team leader and KAIST professor Oh Jun Ho about the background, technical issues and future of the project late last week. OhmyNews: I'm curious about how HUBO could have been developed so quickly and cheaply. Oh Jun Ho: There are a lot of aspects to this. I want to speak in depth. It has to do with changes in the paradigm of technological development. Firstly, I will speak about the concept of development costs. For example, when you talk of the development costs of a car, they could be the actual cost of the product or the investment costs in the production line. And then there is the concept car that might cost 1~2 billion won (US$1~$2 million), which could be a development cost. What exactly is a development cost? It's meaningless to ask how much the development costs were. I felt something when I was watching ASIMO. Honda announced it spent the equivalent of 300 billion won (US$300 million) on it, but frankly, you could have made it for just several billion won. Was there something in the material prices? 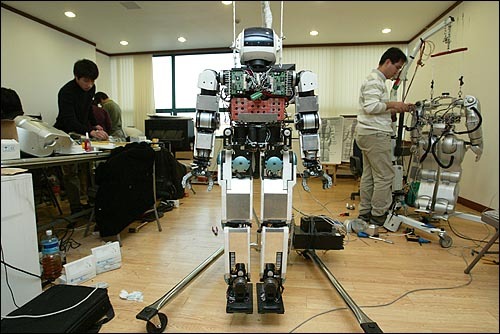 A certain body in Korea also spends about 10 billion won (US$10 million) a year to develop robots. You have to spend like that to start up a research institute with 10 people doing the work. Let's take an example. When a certain research institute establishes a plan to develop robots, they usually set it for 10 years and 10 billion won. You need to gather software experts, motor experts, battery experts, visual experts, sensor experts and so on. If you set a target for 10 years, once you begin, it really takes 10 years. However, when you do things on your own, it's different. I designed HUBO myself, and I made the system architecture and sensors myself. I bought the motors and gears. The "walking algorithm" came straight from my students' heads. Personnel costs for the research team came out to about 500,000 won (US$500) a man. Doing things this way, you can't spend more that 1 billion won. I said 1 billion won, and the amount of money I received was much less. In fact, cumulatively, the amount of money invested in it came out to about 500 million won (US$500,000). Isn't the problem that for this kind of research, don't you need particular researchers who are well versed in all fields? That's true. Since forming my research team, we spent about 15~20 years securing all the technologies, from designs and blueprints to production. A robot is a machine. I had to do the blueprints myself. I finished them in only two weeks. I overcame the difficult process of selecting a motor. And I released all that know-how. What, technologically, was the most difficult stage? Firstly, I couldn't approach the problem with the existing paradigm. It would have taken me 20 years had I done so. All the theses in the world are written according to that paradigm. There were no theses for me to refer to. More difficult was persuading my students. At first, they didn't believe a word I said. No matter what I said, they would bring me this thesis and that thesis that said what I wanted to do was impossible. I tore up whatever thesis they brought me. It took from 6 months up to a year to convince them. For example, if I told them to use motor B instead of motor A, the students would tell me it was impossible, citing some thesis or simulation result. But the use of motor B was breaking existing blueprint concepts. Nobody would imagine that you could use that motor. Even specifications like its size, power and weight were adoptable according to the old plans. As this is now known, I say give everything a try. It seems you went through a lot of ups and down with HUBO. When did KHR-1, HUBO's predecessor, come out? 2002. The KHR-2 was the perfected model that came out in 2003. It was made in at attempt to outdo the Japan's Honda ASIMO. We benchmarked ASIMO in terms of appearance and capabilities. I don't think, by the way, that HUBO is superior to ASIMO. ASIMO is outstanding and worthy of respect. The thing I dare say is that the birth of HUBO is a stepping-stone in competing with Japanese robot technology. It's significant in that we are gradually starting to make a challenge. HUBO's better points are simply that it can move its fingers independently and it doesn't carry a pack on its back. In terms of software, I know that as of now, HUBO cannot walk up stairs. When will this be possible? He will soon be able to walk up stairs. We are now starting research on this. Internally, I don't think there are any problems. I just hope you wait a little bit. If you'd like to know why HUBO couldn't walk up stairs, it's because we didn't have the time to research. We were too busy each day. There is a plan for HUBO to ascend 15cm-high steps. It just hasn't been embodied in the actual robot yet. We will also begin research on allowing HUBO to jump. We aim to have him walk along carrying a person. We need to technologically overcome issues like how to make him walk in a graceful manner, so this is another matter to research. Another important thing is performance. HUBO is being made as a work of art. This will appeal to the people. When people see it, they will be surprised. HUBO is the renamed third generation humanoid robot KHR-3. Please explain what you mean by sublimating this project to art. What capabilities will be added or improved with HUBO, and when could we expect them? In fact, the question of whether a robot has intelligence or feelings is a scientific one. Whether it seems like it does is one of acting and art. I want to make HUBO so that he seems to possess intelligence. Of course, the basis of this is completely technological. Based on technology, I want HUBO to act and attain the state of the art. This year's budget is being decided, and I plan to use much or it for this purpose. I also plan to hire specialists. I plan to make HUBO look nicer and develop him into some sort of character. I will also research how to maximize his performance effectiveness. I'd like to make him more aware. I can't say for certain when the next version of HUBO can be made. If possible, however, you will see a robot with these capabilities this year or next year at the latest. Shouldn't we believe that the prior research done on ASIMO was of help to HUBO? It's true it gave me a start. That it was already completed challenged me and allowed me to achieve my results. When I first developed HUBO, I thought ASIMO could move each or its fingers independently. I later found out we were the first ones to do that. Honda doesn't announce its technology related to ASIMO. And I didn't want to reference it. Accordingly, I needed to change a lot of concepts. HUBO was possible after overcoming this. If were stuck in ASIMO's paradigm, HUBO could never have been developed. Has there been a response as HUBO makes a name for itself in the foreign press? When KHR-2 was announced, Japanese scholars were surprised. Those Honda figures involved with ASIMO mostly knew what was going on, so I have yet to hear a direct response from them since HUBO was announced. I've just gotten faxes and emails from abroad, mostly asking if they could buy it or rent it. I also got an email from a Microsoft official who said he'd like to meet since they would like to do robot-related research. I've gotten responses from Taiwan and the United States praising HUBO. Could you discuss points that were difficult technologically or policy-wise as you were developing HUBO? The Ministry of Science and Technology judged that it would not officially research humanoid robot technology as a frontier project. I made several offers, but they were all rejected. I understand why the ministry refused. Where are you going to use a humanoid robot? Honda spent 300 billion won, so where are we going to get that type of money? Japan took 20 years to research it, so how long are we going to take? Even now, we still get the same kind of policy consideration. Major research groups cannot accept humanoid robot research. This is because it demands a lot of money. So they tell me that since I'm not an investor or an industrial group, it would be problematic. It seems like this is what they are thinking. The team is looking at enabling the fourth generation robot to climb stairs by early next year. Wouldn't it do to create a humanoid robot industry and continuously carry out projects? Just a short time ago, the spotlight was focused on HUBO and me personally. People wanted to know what kind of person I was, and about my experience and background. In this way, I'm similar to Dr. Hwang Woo Suk. Robots and stem-cell research are interesting topics in and of themselves. Moreover, Dr. Hwang and I are outside the mainstream of the academic world. We didn't go into industry to achieve our results. Rather, we struggled on our own to obtain them. 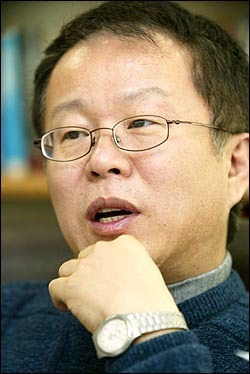 Had Dr. Hwang's results been obtained within Seoul National University's bioscience organization, he would not have received the limelight. If I had made HUBO in some sort of humanoid robot organization, neither the robot nor I would have received any attention, because as the result of several years of research with billions of won in research costs, it would have been seen as natural. Moreover, if you make a company, you mobility is limited. Dr. Hwang is in the same position, and I think I must continue in that spirit. They say HUBO lacks about 20~30 percent of ASIMO's technology. What are its limitations? We need to strengthen the algorithms. We need to perfect it mechanically. That is to say, we need to make it more stable. For example, there are occasional errors like the wires sometime disconnect as it walks. It's also difficult for robots to walk, at least on two legs. We need to do a lot of research on bipedal walking. I don't think HUBO walks; I think he shows us an image that he can walk. Walking is an unnatural thing for a robot. To appear like it's walking naturally is a very bothersome task from the robot's position. There are many people who are curious as to where a humanoid robot could be immediately used. I think it has three uses -- indirect, direct and abstract. On an abstract level, it's interesting. Moreover, humanoid robots are highly symbolic of technology. It raises our technological credibility. If we couldn't make a humanoid robot here while only ASIMO made a name for itself in the world, people would think we lack robot technology in Korea. With the birth of HUBO, we are acknowledged by the world in terms of our technological credibility. Because faith in technology is increasing, I think the commercial power of robot-related products will increase. Look at why they will probably begin selling cleaning robots. The technological credibility of humanoid robots will have a great effect in the industrial world. This is their indirect use. There is another indirect use. Humanoid robots demand a high level of technology. Unless you use good parts, it won't move. In the same way that Switzerland's Maxon Motors grew world-famous with the Mars "Sprit" robot probe, HUBO itself is good for making our name known. Moreover, it's a good test bed for motors and artificial intelligence. It's a test bed that could be used to try out all technologies related to automation. Directly, humanoid robots themselves could become an industry. I was contacted by one investor from Beverly Hills in the United States who wanted to make a robot theme park. Robot theme parks could be one direct use. Uses will inevitably pop up, like in nuclear power plants where one cannot use wheels or tracks. It will be used in sectors that demand observation devises that can walk on two legs. In the case of Japan, it's big businesses like Honda and Toyota that are leading the robot industry. In Korea's case, it's small and medium-sized businesses and research centers that are pushing it. Why do you think there is this difference? In Japan, everyone is doing it, like Honda, Toyota, Sony and Matsushita. 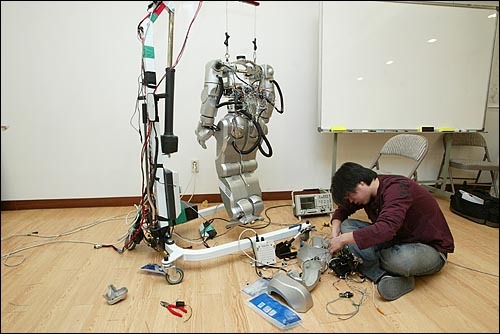 Big Korean corporations don't research robotics, because they don't see it as a money making sector. Japan has this sense of mission that it must lead the robotics industry. I am certain that robotics will become a core industry someday. At the basis of this is the fact that there are currently no household appliances that are "mobility" products, which is to say, products that move. I think there is a need, however, for appliances that move on their own to hit the market. I don't know if they will be cleaning robots or another form of robot. Just as the washing machine was revolutionary for housewives, robots could lead a similar revolution. It doesn't appear that big Korean companies are paying attention. That's because they might not make money on it, because it's system technology.